Tuna salad is still tuna salad without the bread! Embrace the keto lifestyle change and serve your fish over a bed of fresh greens and always be sure that your health comes first. Grains, gluten and non-gluten, have been around for thousands of years, yet they cause all sorts of problems in the modern, wheat-filled diet, so avoid them at all costs and opt for satisfying nourishment instead. Here, the nutrients are coming from tuna, and now is the time to purchase the best you can afford. If you have the time to cook your own tuna steaks and shred the meat, then go for it, that is the freshest you can get! If you have time to open a can of fish, that’s very reasonable and practical too, just know what to buy and what to avoid in choosing canned fish. You will want to seek out a good source of light or skipjack tuna from the United States or Asia, and make sure that it is not packed in certain oils, such as canola or soybean oil. When all is said and done, find a brand that you trust and support them, as consumers always speak with their purchases. 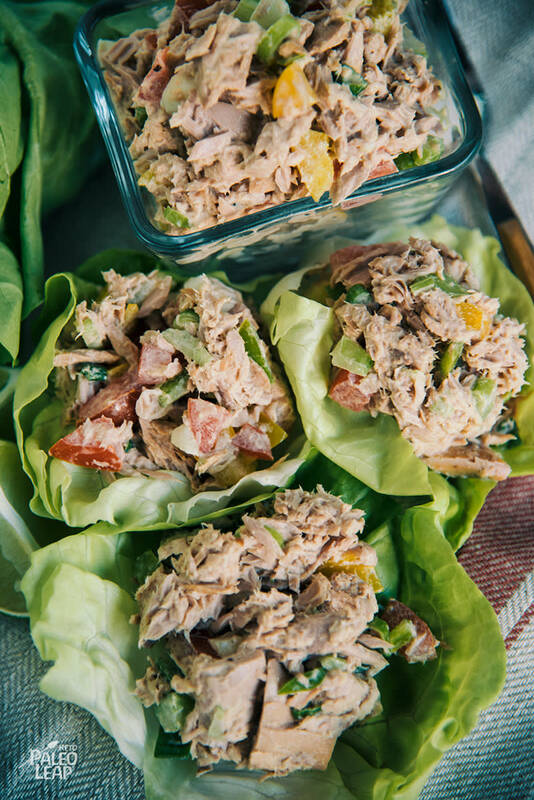 With the sourcing of quality tuna out of the way, you can get back to the business of eating and enjoying life, one tuna salad at a time. Whatever you do, never forget the homemade mayonnaise! In a bowl combine the Paleo mayonnaise, lemon juice, Dijon, and season to taste. In another bowl combine all the other remaining ingredients. Pour the mayo mixture over the tuna and toss until everything is well mixed. Serve the tuna salad over fresh greens.